Bangladesh Army Gen chief Aziz Ahmed (centre) at Bangladesh Embassy in Saudi Arabia. Sheikh Hasina-led Bangladesh government on February 14 will sign a defence deal with Saudi Arabia to boost military cooperation between the two countries. 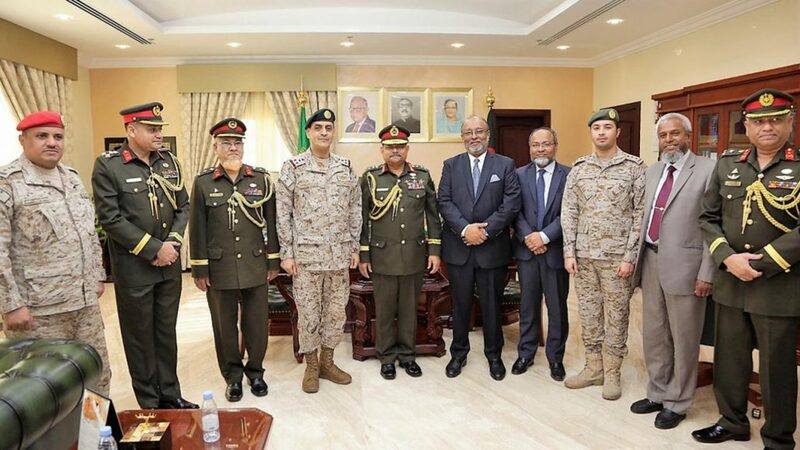 According to a Daily Star report, Bangladesh Army chief GenAziz Ahmed made the declaration after meeting Saudi’s chief of joint forces Fayyad bin Hamed Al-Ruwaili. A press release from Bangladesh’s embassay in Riyadh says, under the deal, Bangladesh will be defusing mines along the borders of war-torn Yemen. If the deal is signed, 1,800 Bangladeshi troops will be deployed in Saudi Arabia, which is expected to take bilateral military cooperation to new heights. During Gen Aziz’s meeting with Al-Ruwaili, the two military officials discussed bilateral issues. Also, Bangladesh discussed sending military engineers to construct military and civilian construction works in Saudi Arabia. Gen Aziz said, Bangladesh named of four military officials including a brigadier general for joining Saudi’s Islamic Military Counter Terrorism Coalition. “There is excellent bilateral relationship between the two countries,” Gen Aziz said, hoping that the ties will be stronger in the future.